The company’s website offers some basic information about these products but it doesn’t include a comparison of the two. What we’ll do here is examine each model and then compare. When you’re done reading this article, you’ll be able to decide which unit is best suited for your air purifying needs. Designed to tackle the air in a 322 square-foot area, the LV-PUR131 is a true workhorse. 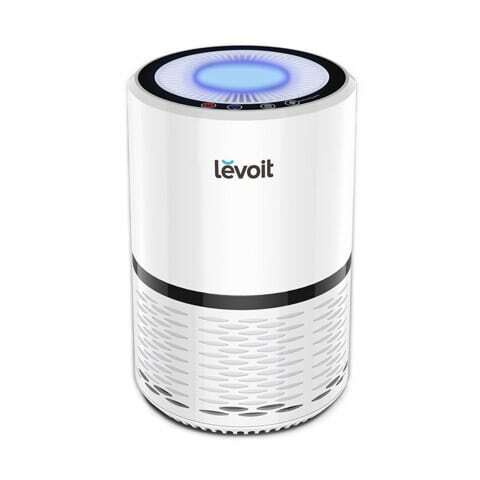 Weighing only 11.2 pounds, this unit quietly, efficiently and quickly removes up to 99.97% of the contaminants that contribute to allergies, nasal problems and other illnesses, including dust, pollen, smoke, cooking or other odors, mold spores and pet dander. It filters particles as small as 0.3 microns and air pollution of PM 2.5. As noted above, the unit is best suited for large areas. Setup is a breeze. Simply unwrap the main unit from its plastic packaging, then tilt down the back door and remove all the protective plastic from the internal filters. Pop the filters back into place (easy-to-see tabs show you which side of the filter should face outward), plug in, and turn on. That’s it. Quick-setup instructions are easy to read and understand. A full manual is also included. The unit also comes with a fourth, timed setting, that intermittently activates the LV-PUR131 as conditions require. The lowest setting is, of course, the quietest, producing a pleasing white-noise that is restful and non-intrusive. As the settings increase, so does the sound, but not unpleasantly so. The LV-PUR131 is remarkably quiet at even the highest setting. Measuring 18.5 inches high, 14.5 inches wide and 7.2 inches in depth, the LV-PUR131 blends easily into any décor. It should, however, stand at least 14 inches away from any possible obstructions, such as walls, radiators, furniture, etc., in order to give the unit free access to air flow in the room. 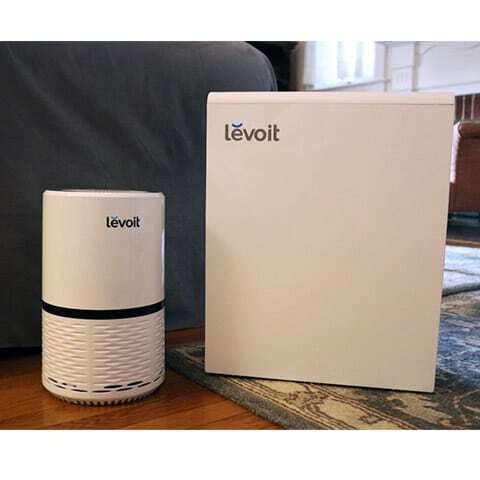 For our Levoit LV-PUR131 review, we tested it in two areas: a large, half-finished basement with lingering, musty odors and high dust accumulation, and the downstairs living and cooking area of a two-story home. After a thorough dusting in the basement, we ran the unit at its highest setting for 24 hours, during which it reduced by as much as two-thirds the most noticeable odors. The middle setting, running for another 24 hours, completely eliminated all odors. From that point on, we ran the LV-PUR131 on its intermittent setting, which kept the air in the basement clean and fresh, and dust-free. In the downstairs living area, running at the highest setting, the LV-PUR131 completely neutralized all odors that were generated by pets and several sustained cooking sessions. A reduction of pet hair was also noticed. We ran the unit at full speed while the kitchen was in use, and noticed that it immediately reduced the cooking smells by at least half. After that, a maintenance (middle) setting was all that was needed in order to mop up the remaining odors and keep the area smelling fresh. Because the unit was tested in the area where the most odors were produced, the air upstairs—which had no purifier—was also noticeably cleaner and free of odors. We used the night-time setting to save energy. Note: The LV-PUR131 now comes in a Wi-Fi enabled version. All features are the same but you can also control it with a mobile device. If that interstes you, see our LV-PUR131S review here. The smaller of the two units, the LV-H132 is ideal for a sleeping area, workroom, office, studio, or even a hospital room. It could, conceivably, be used on a nightstand. We tested it in a bedroom, an office and an artist’s studio, where it performed admirably under all conditions. 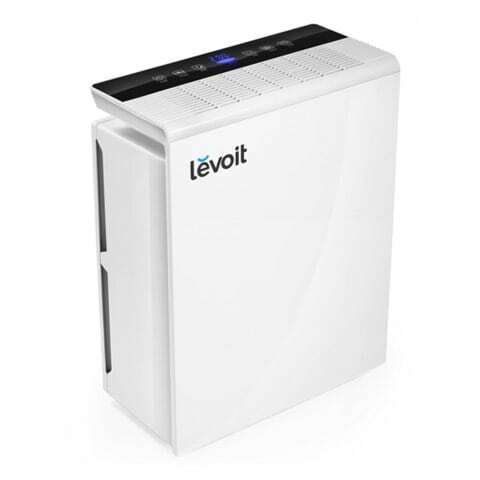 The LV-H132 effectively purifies the air in 86 square feet of space. The LV-H132’s unique size makes it a perfect addition to any room. Cylindrical in shape, it stands 14.5 inches high and has a diameter of 8.5 inches. It weighs only 6.6 pounds. Because of its compactness, it is unobtrusive, but—like its counterpart, the LV-PUR131—needs about 14 inches of clearance from walls, radiators or anything else that would interfere with its access to the air flow of an area. Setup is easy too. Remove the unit from its plastic wrapping. A quick half-turn of the base of the unit removes the bottom plate and gives you access to the filter. Remove the protective plastic from the filter, put it back (again, tabs are provided to show you which area of the filter should face outward), and reattach the base. Plug it in, and you’re ready to go. Clearly printed and easily understood setup instructions are provided, as well as a full manual. and the highest mode for use in extreme conditions. It will effectively eliminate removes 99.97% of contaminants from the air down to 0.3 microns in size. This includes allergens, smoke, dust, mold and home and pet odors. Each setting is accessed by the lightest touch of a finger on the appropriate sensor. The LV-H132 also comes with a night light on the top of the unit. One touch turns it on, another dims the light and another will turn it off. While the night light is a clever touch, and can be quite useful, it is also a bit too bright, even on the dimmest setting. The light is a cold, bright blue; a softer, warmer light would be more appropriate for a darkened room. Still, for folks who don’t mind the brightness, it’s a nice feature. In each setting we used during our Levoit LV-H132 review, it performed to perfection—especially in the artist’s studio where the odor of paint was prevalent. In all situations, it removed odors and left the air crisp and clean. In the bedroom, on the lowest setting, it provided a quiet, sleep-friendly white noise; even at higher modes, the noise was not enough to disrupt sleep. For daytime use, we left the unit on the middle setting. This really helped to cut down on dust and floating pet allergens in the bedroom, since breathing got noticeable easier throughout the night with less nasal congestion and lung irritation.